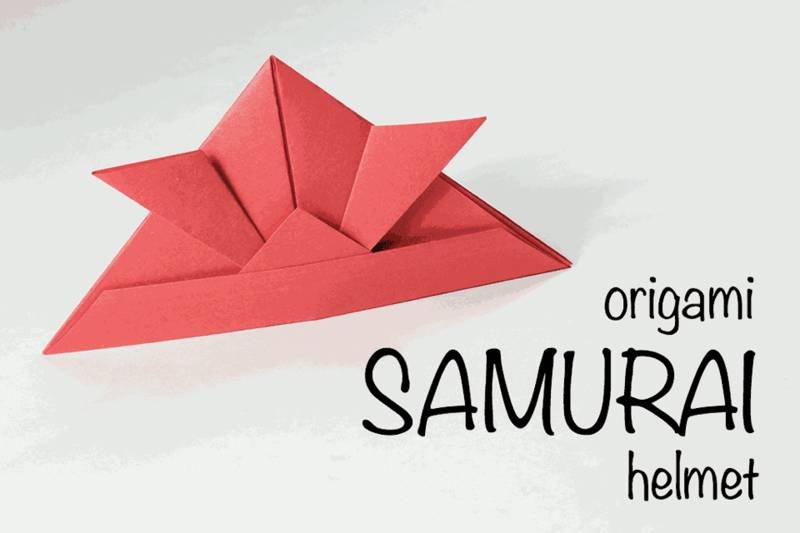 This is a fun and practical origami model -- the traditional samurai helmet. Kids will be able to get the hang of this model quite quickly - making it the perfect craft to make at a boys birthday party or as a rainy day activity for your kids. If you start with big enough paper, perhaps newspaper or gift wrap, the helmet can be worn as a real hat for dress ups! Another fun thing to do is make small ones and use them as finger hats and then draw faces on your fingers! All you need for this simple origami is one square piece of paper, any size. If you have paper that has a different color or pattern on each side, then you can get some fun results, as the bottom band will be different from the rest of the helmet. The paper used for this tutorial -- it has Japanese Samurai prints on one side and a solid color on the other -- is made by Tuttle. Start off with the color you would like to end up on the bottom band of the helmet facing up. 1. Fold the paper down in half. 2. Fold the right corner down to the bottom center point. 3. Now fold the left corner down to the bottom center point. 4. Fold both of the flaps up to the top middle point. 5. & 6. Now you need to fold the right and left flaps down from the center as shown. 7. You should now have this. 8. Fold one layer from the bottom up to where it is indicated. 9. Fold the top layer up. 10. This should be the result. 11. Fold the remaining layer up to the top and unfold. 12. Insert the bottom section inside the helmet. You have now finished making your origami samurai helmet, the first attempt often looks funny, try again and I'll bet it will turn out better the second time around!